By applying the DakotaFire Systems™ gel to any structure (such as homes, businesses, cars, and power poles) you are able to protect these assets from destruction. Fire protection has never been more simple than it is with this unique piece of firefighting equipment. It allows you to protect land and structures well ahead of the fire so you and your crew can make a quick and safe retreat. An average 2,500-square-foot home can be covered and protected in just 15 minutes. 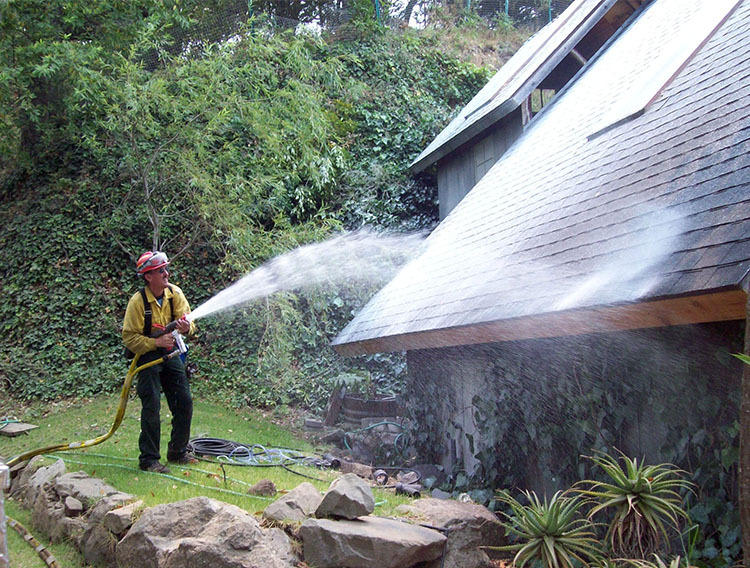 If the fire is slow burning, a light mist of water can be applied to the sprayed gel, causing the gel to reactivate. This can be performed as many times as needed for several days. With just ¼ inch of gel, a home can be protected from an impending fire. As the perfect fire protection tool, this piece of firefighting equipment is portable and only needs two firefighters to carry it. The DakotaFire Systems™ gel delivery system can be attached to an ATV and transported into rural areas that are difficult to reach in a firetruck. The DakotaFire Systems™ is designed around standard firefighting equipment, making it simple to set up and quick to use while on the job. After a fire has passed and an area is out of danger, the pressurized gel can be washed off with water. The gel will turn into a milky looking liquid that will absorb into the ground in a matter of just a few days. This gel is environmentally friendly, safe for plants, and animals. The pressurized gel system makes reaching large heights easier with its extended reach. Mountainous areas can be protected more efficiently as taller trees and abundances of land will have more protection. This piece of firefighting equipment is crucial to proper fire protection and prevention, saving not only lives, but land and structures as well.